1. Franklin County was the second most racially diverse county in Vermont according to the 2000 Census. According to the 2010 Census, Franklin County is the fifth most racially diverse county, exceeded by Chittenden, Addison, Windham, and what other county? 2. According to the 2010 Census, Montgomery remains the County's smallest (14th) town by population. What was it's highest past census ranking? In this edition I wanted to take a moment to talk about something we've made a concerted effort to improve over the last several years, something I call history community outreach. While you can argue everything we do impacts the community, I wanted to highlight some of those things that tend to be a bit less visible. - For the last several years we've written articles for the Town Reports. Besides providing an interesting bit of reading we think it helps the people think about our shared heritage and contributing their own pieces of history to the community at large. - We've provided similar articles to the Wild and Scenic River Study Group, the Covered Bridges Garden Club, and the Town. In the latter case, it was in support of a recent grant application to replace two of the Village Green's maple trees. - We've also supplied information to the St. Albans Messenger and Vermont Magazine for articles on the Town in recent issues. - Our web site has expanded and has been used by the State to update their veterans burial records, and by other citizens and friends of our Town. - Our support to schools and students is manifest by our annual scholarships, school visits, and support to the Teaching American History program. - Exhibits and studies remain a priority. Our latest exhibit focused on the history of Montgomery schools. We've also recently done mini exhibits, essays, or updates documenting the windows of Pratt Hall, the Montgomery stage, and the history of Pratt Hall. - The third edition of the Town History book is progressing and will document the major events and cultural tides in Montgomery over the past 20 years. - We represent the Town at regional Historical Societies meetings and will host the next one in May. These give us a chance to network with our counterparts. We will also participate in our first regional Historical Society Expo in Franklin in July. This is a new event taking the place of the State Expos which are now held only in even years. We do all of this and continue to provide stewardship of Pratt Hall and our collection of artifacts, and sponsor the annual Memorial Day Commemoration, Concerts by the Common, the Art Show, and Candles and Carols. This is an immense effort by your Board and other members, all volunteers, and all dedicated to making our community a richer place. Tell your friends about what we do. Suggest they join us if they are not a member. Be proud of your role in our accomplishments, and most importantly thank you for your support. We are now 1,201 strong, up just over 20% from 2000 (which was up 20% from 1990). This is about the same population as back in 1940 and 1860. It's also about 50 more than previous Census Bureau estimates. It was the 15th greatest percentage increase of any town in the State, and 24th greatest raw number increase. We are still the smallest town by population in the county but we're gaining. Enosburg, Richford, and Saint Albans all lost population while Franklin County's total population increased by about 5%. Franklin County's and towns' census totals going back to 1800 are available at the History link on our web site. Our thanks to the Free Press for allowing us to link to their web site. MHS/TD Bank Affinity Program Members - 72. The MHS provided another article for the 2010 Town Report. This edition included a photo copy of the 1811 Warning which was hand written by Henry Marble, the Town's second Town Clerk. We included a transcription and also a summary of the minutes which is repeated below. "According to the minutes of the meeting, it convened as scheduled, and they elected officers as set out in Articles 1 and 2. There was also a vote to set out what was a new school district, District 3, "on the Hill south of the Mills", what is probably the area of Route 118 south of the Center today. Oaths were taken by the elected officers except for Henry Marble, the Town Clerk, who was absent. The meeting was then adjourned to March 30th at 2:00p.m. The rest of the business would be done on March 30th. Article 3 was passed over. Most of the remaining meeting appears to have dealt with arrangements for school buildings (leased space) and settling up financial accounts. The Town's school tax was levied, about $30. No money was appropriated for contingencies. 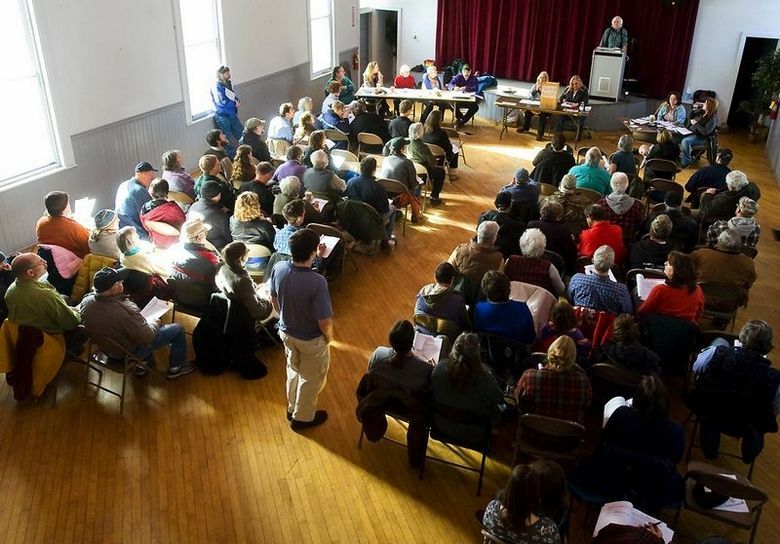 Montgomery's population in 1811 was about 240 and there were 76 students apportioned between the two school districts prior to Town Meeting." 2. D. 5th. In 1920 Montgomery was fifth largest behind St. Albans, Swanton, Enosburg Falls, and Richford. In 1984 the Montgomery Village Store (formerly the Parker's Store) burned down. It was a total loss. The lot is now owned by the MHS. The Hazen Notch School (School District 6), a one room school house, operated for 21 years, closing in 1927. In that period it had 23 different teachers. Our 2011 membership drive kicked off in late March. You should have received our mailing by now. It will be a challenging year, with a our major restoration project on Pratt Hall and our usual programs and activities. If you've been a member in the past thank you. If not, what better time to join or re-join? We hope we can count on you to help us continue our work and to keep us moving forward, making history everyday. The MHS was awarded a $1,000 grant by the National Trust for Historic Preservation from the Daniel K. Thorne Intervention Fund on March 14th. The funds will be used to help make urgent structural repairs to the lower portion of its gothic bell and clock tower on the former Episcopal Church. "Work on the tower started in January anticipating we would need repairs to the foundation, sills, and lower portion of the timbers of the tower” said Society Chairman Scott Perry. 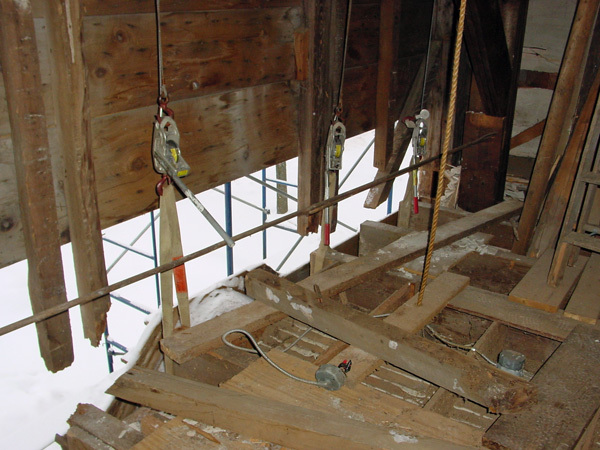 “Once work began the timber framer discovered more serious structural problems in urgent need of attention. This grant will help pay for those unanticipated repairs." "Without organizations like the Montgomery Historical Society, communities and towns all across America would have a diminished sense of place," said Stephanie Meeks, president of the National Trust for Historic Preservation. "The National Trust for Historic Preservation is honored to provide a grant to the Montgomery Historical Society, which will use the funds to help preserve an important piece of our shared heritage." We're about half way complete on our tower/entryway project, with most of the structural repair to the front wall timber frame wrapped up. If it ever stops snowing we'll be able to do the finish work. One thing will be done differently, the door molding will be restored as closely as possible to what was there in the early 1900s. Shown below is the large molding around the upper part of the door, which we are calling the hood. A similar style of molding used to be above the louvers at the bell stage as well. You'll notice that the molding ends with a miter and horizontal piece on each side. This is classic gothic design and is covered in Bishop John Henry Hopkin's 1836 book on the subject. 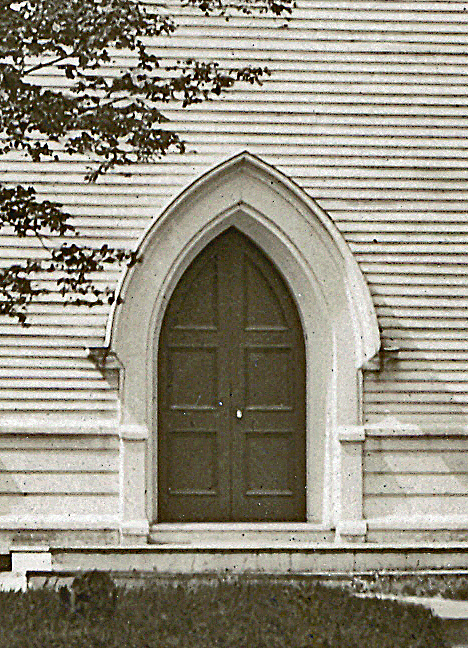 Bishop Hopkin's was the first Episcopal Bishop of Vermont, and designed a number of gothic churches. He consecrated our church in 1835. This project has been financed in part by a combination of grants from the Vermont Division for Historic Preservation, the Eastman Charitable Foundation, the National Trust for Historic Preservation, TD Bank, and the Preservation Trust of Vermont, but over a third of the estimated $26,000 will come directly from your membership donations. A big thank you to all! This year's cover girls were Sally Newton and Lois Lumbra. They have both been long time members and boosters of the MHS and very deserving of the recognition. Congratulations Sally and Lois. There once was an old hall named Pratt. On history beginning with Clapps.